KCET Application Form 2018: This is the entrance exam for those who have passed class 10+2 with PCM and willing to get admission in the engineering colleges for pursuing the undergraduate degree. The submission of online applications for Karnataka CET 2018 has been started from January 2018 and the candidates will be able to register themselves online until February 2018. Applicants will be able to fill the KCET Application Form 2018 by following the procedural steps given below or they can access the direct link below, from where they can directly register themselves online for the Karnataka Common Entrance Test Registration Form 2018. To fill online application form applicants have to meet eligibility criteria. The Karnataka Common Entrance test is commonly known as KCET. Candidates should have passed their 10+2 standard with Physics, Chemistry, Maths, and English. Should have obtained at least 45% Marks in Physics and Mathematics. Interested applicants who filling the examination application form they can refer this dates. Following are the KCET Exam Dates 2018 is given down. Candidates who are interested in participating in the Karnataka common entrance test 2018 they are advised to register themselves by submitting the Karnataka CET Application Form 2018 between the dates January to February 2018. All the candidates are advised to check the notification before start applying for Karnataka CET, only the candidates meeting the eligibility norms in all the aspects are invited to register themselves for Karnataka CET Application form 2018. Click on the official website of KEA, i.e. kea.kar.nic.in/. Go through the complete advertisement of KCET after following the notification section. Click on Apply Online button after meeting the eligibility norms. Pay the necessary application charges. Candidates need to qualify the entrance exam that will be conducted on 03rd and 04th May 2018. Candidates need to qualify the KCET Cutoff 2018 and then the selected candidates are invited to fill their counselling form. Then the seats will be allotted to the candidates as per the choices filled in the counselling form and the KCET Merit 2018. Every year a huge number of candidates apply for Karnataka Common Entrance Test for getting the admission in classroom engineering courses in various engineering colleges located in the Karnataka State. Candidates are advised to register themselves for Karnataka CET 2018 Application Form as the online registration process has been started from January and the online applications will be accepted until February 2018. Before start applying, candidates should make it sure that they have to satisfy the eligibility criteria to fill the form. 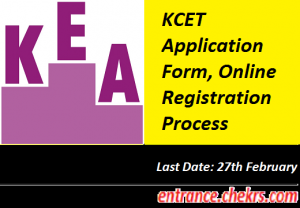 Here in this article, we have discussed the complete process for the submission of KCET Registration Form 2018 they will get other information by checking the above procedure or they can contact us by commenting at the end of the post.